The other day I finally gave in and let Jack feed himself yogurt. He's been wanting to feed himself for awhile, but I just wasn't ready to deal with the mess that comes with a baby self feeding himself. It was very messy, but a lot of fun! Even though Owen isn't anywhere near as messy as Jack is he still manages to have yogurt drip down his chin. Yeah all the shiny stuff is blueberry yogurt. Owen is such a goofy boy! Definitely messy! Surprisingly he did really well using the spoon and it kept him super busy for quite a while. 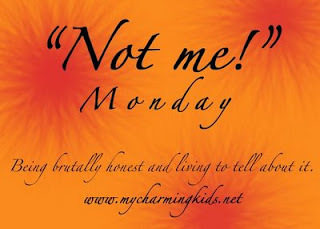 It's been two weeks since the last Not Me Monday over at MckMama's so get ready and hold on tight! 1. I do not specifically go shopping at Costco with my boys during the lunch hour because I know there will be plenty of demos going on so they can eat lunch, stay happy and I can get my grocery shopping done. Furthermore...I would not pick up a sample of a Chicken Bake of the floor and feed it to my son for goodness sakes who knows what's living on the floor of a Costco! 2. Two weeks ago I did not go in to get Owen after his nap and hear, "poop poop undies" right when I walked in. I also didn't see Owen's night-night undies (Pull-Ups) half removed and poop on the sheets. Oh no...my child does not remove his poopy Pull-Ups and get skid marks on my nice clean guest sheets! 3. I did not go to Value Village and realize that Jack had pooped and then open the diaper bag to find that there we NO diapers. I always restock my diaper bag. I did not have to use one of Owen's Little Swimmers instead. Later when we arrived home I would not put the same pair of Little Swimmers back in the diaper bag since Jack didn't pee or poop in them. Hey they may come in handy again...I mean of course they won't because that didn't happen! 4. I did not decide one day to actually dress up in nice jeans and a fancier top and then proceed to take the boys for a walk around the neighborhood in the wagon. Who do I think I am...one of the Jersey Housewives! I also did not get in a working mood when we got home from our walk and do a bunch of yard work in my same nice clothes and dressier shoes. Who does that? 5. I definitely did not walk into the bathroom this last week to find Owen swirling his foot in the toilet with his sock on in water the had just peed in. This would be absolutely disgusting and not something my child would do. 6. I am not re-reading the Twilight Series and totally addicted to it like it's the first time I've read it. I have not tried to immerse myself in a Bella/Edward/Jacob world ever free moment of my day for the last 3 days. Free moment....what's that! Okay it's your turn to 'fess up! Walking, talking and bending over all without falling. He's so talented! Mama is proud! This is Jack's pretend phone from his kitchen. It's so cute how he's kissing the phone. I've posted two other The View From Here posts...if you'd like to check them out click here and here. Both of my previous posts were taken from my front yard, but since we've been working the backyard I thought I'd show you a different view of that instead. I was sitting on an old wood ladder that we have leaning up against a tree. Here is Owen over by the easement pushing his wheelbarrow and watching an airplane go buy. This time around the planes were landing and not taking off over our house. Here is a picture of our neighbors deck. Owen is the little red dot in the picture. He was yelling, "Vondo" when I was taking the picture. Our neighbors name is Vonda and she gave Owen a cookie the other night and now he thinks she should give him one every night. Here is a picture of our other neighbors backyard. Survey (I'm not sure if that's how you spell his name, but that's how it sounds) built his deck himself. See the tall plants by the back of his house...yeah that's how peas are supposed to look. Here's our deck with 17 or so stairs down to the backyard. The part under the deck is where we store our firewood. As you can see all of our houses are really tall in the back. That door is actually to our "crawlspace". It's about 17 feet high so it's funny to call it that, but that's what it was listed as when we signed the papers to the house. It's unfinished right now so it's just used as storage. Our hope is to one day remodel it and put a kitchenette, a bathroom and a schoolroom down there. Since I'm going to home school the boys it would be great to have a separate space to do school. Also the swing set will be in the backyard so it will be perfect for recess. This Friday we are showing off our master bedrooms. Our master bedroom is decorated with a bunch of our wedding memorabilla. We got this king size headboard and footboard from JCP's and it only cost $150. I love having a king size bed. I'm not much of a snuggler so I like having my own space to stretch out and catch my Z's. The open door leads to our master bathroom...if you'd like to check that out click here. This is the picture above our bed. The flowers are from our wedding. I have the name plaque made at the Puyallup Fair for $9 before were were married. It says, "Michael & Lyndsay Forever & Always - May 8th 1999. Michael was working in a retirement community and his older gentlemen was going to sell this TV armoire to us for $50, but once he found out we were young and newly married he just gave it to Michael and said that he had been there once. It was really sweet. We had to do a bit of work to it because it actually had the original TV built into it. These are the pictures to the left of the armoire. I love having belly pictures taken when I'm pregnant. I'm pregnant with Owen on the left and Jack on the right. The Willow Tree Angel was given to me by my friend Christa. This shelf is filled with a bunch of our wedding stuff. Left to right, top...the pen everyone used to write in our guest book, battery operated candle centerpiece at our reception, porcelin dolls (gift from my maid of honor), picture book. Left to right, bottom...party favor that was at the table at our rehearsal dinner, wedding picture, unity candle, cake topper, garter and the glasses we used for our toast. Last year I finally convinced Michael to install ceiling fan...I love it. The chair in the corner is the most comfortable chair ever. It was a gift from my mom and dad when Jack was born. I use it as my nursing/pumping chair. This is our engagement picture with all the notes that people wrote to us at our reception. Here is the wedding picture collage I made from a bunch of our pictures. The picture on the top was taken at Sleeping Beauty Castle in Disneyland and the picture on the bottome is made from 4 of the cards we received at our wedding. Guess Who Had A Brother? Those darn moles come in pairs!! We had about a week and a half of no holes in our yard. Oh well it was good while it lasted. Stay tuned for more pictures of dead moles....I know you're all on the edge of your seat. Update: Jack woke up at 6:30 this morning...I guess I shouldn't jinx myself by writing about such things! This little guys naps and night time sleep have been growing longer and longer. I can't tell you how happy this makes mommy. Owen has always been a great sleeper, but Jack has had to grow to love the idea. Lately he's been going to bed around 8 and sleeping until 7:30 or so. It's awesome! Tuesday afternoon I put him down for his nap at 2 and I finally had to go get him around 4:40. As you can see he wasn't too keen with me taking pictures right after he woke up. After dinner we went outside to tend to the other part of our daily life that is growing...my garden! Here are all the corn I transplanted on Thursday. I wasn't sure if they were going to make it at first because they got a little weepy, but since we got all that rain it helped a lot. Jack of course is enjoying one of his favorite past times of...eating dirt! Soon these flower buds will be yummy tomatoes. Mmmmmm!!! Here are my 3 strawberry plants, more corn and 3 rows of romaine. Next year we are going to buy PVC pipes and plant our strawberries in those suspended from the deck. It saves space and you can plant a ton of them that way. You can see the little dent I made in our romaine from our salad the other day....seriously if anyone reading this blog would like some lettuce you can have romaine or green leaf there is tons. Onions, more corn and the leaf lettuce. Yeah I'm gonna have a lot of corn too so if you'd like some of that just let me know. I'd hate to see it go to waste. More corn....I know I got carried away! Here are my not so pretty sugar snap peas. We didn't put anything down for them to climb up so they clung to each other instead. Next year we'll put down chicken wire so it won't get all tangled. Here are three of my 6 zucchini plants. I'm sure I'll have some extras of these as well if any of you would like some. Here's another thing that's grown...the retaining wall in the backyard. The new part that Michael's working on is the lower wall on the left. Right by the existing not so straight wall on the right is where we are going to make more gardening space so I can plant even more fruits and veggies next year. I've already got my list of what I would like to plant in addition to what I planted this year...cucumbers, bell peppers, watermelon, cantaloupe, cauliflower and maybe an artichoke tree (or bush I'm not sure what it is). Here's the new retaining wall heading into the yard. Michael researched online how to build the wall. It's not really as hard as I thought it would be, but I'm not the one doing the work. Michael digging to China as he says. Thankfully the previous owners of our house left us a bunch of yard tools...one of which was a pickax. That tool has come in very handy. The drainage pipes we picked up at Lowe's the other day. We are going to route the water from the gutters under the yard and threw to the other side of the retaining wall. My mom and Melody! Congratulations! They both got 3 out of the 4 additional ingredients correct. There was in fact ham, cheese (sharp to be specific) and carrots in my salad. The 4th mystery ingredients was orange bell peppers. They were a little hard to see since two of the other ingredients were also orange. After the picture was taken I added oyster crackers instead of croutons and then we topped it with Johnny's Ranch Dressing. I'm weird when it comes to my dressing though so I never put it on the salad itself. I let everyone decide how much they would like on their salad. Thanks for playing along! Watch Out Simon...Here Comes Owen! I sing to the boys all the time. We also have the Christian Radio Station playing in the house and the car. I love to sing regular songs and I love to make up silly songs. Owen loves to hear me sing...thankfully he's not judgemental...yet. After I finish singing a song he always says, "Again!" He's so sweet! I've been wondering when he was going to start joining in and he finally did last week. Out of the blue he started singing How Great Is Our God by Chris Tomlin. I was so ecstatic. So I asked him to sing it again and he did. The song goes, How great is our God, sing with me, How great is our God. Well when Owen sang it he sang, "How great is r Og, sing with mama". He's so funny! In the video his idea of singing is more screaming so I think we need to work on that part, but it's just so cute. On Saturday night my parents came over so Michael and I could go out on a date. It was the first time we've gone on a date since getting home from San Francisco. Can you believe it...I didn't take one picture! I was so mad at myself. So you just have to be satisfied with the photos from the websites of the places we went. We went to downtown Seattle and ate at PF Changs. I've eaten there before, but it was Michael's first time. I had never eaten at the one in Seattle so that was nice. After our dinner we walked around and bought some candy in the Westlake Mall. Then is was off to theater...the Taproot Theater. 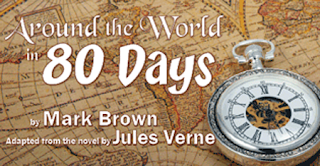 We had tickets to the very last showing of Around the World in 80 Days. I wasn't sure if I was going to like the theater because it was my first time going there. I've been to the Paramount to see Chicago, but I had seen the movie so I knew I would probably like the live production. Well...I absolutely loved the play. It was so funny! There were only 5 actors in the whole thing and one guy had a main part, but he also played 17 other small parts. He would just change his costume a little and take on a different accent. It was very entertaining and I can't wait to go back. When I filmed this Jack hadn't even been walking for a week yet. He was SO holding out on us! It's funny how since he's had his birthday he's looking and I think acting like a bigger boy now. It might just be me looking at him differently though. I got this idea from one of the blogs I read (I think Mckmama's, but I'm not positive). You just give your kids a bowl of water and let them "paint". This is the first time I've let Owen "paint". He's pretend painted before around the house with my basting brush, but it just donned on me to let him have fun with water. He had a blast and wasn't happy when we had to leave. Of course he was soaked, but it dried fast and it kept him busy for quite a while. Time To Get Cleaned Up! Michael had to work late on Tuesday night so the boys played in the rock pile while I gathered up yard waste in our backyard. When it was time to go in I wasn't the only one in need of a bath, so I decided to take the boys into the big tub with me. Owen loves to splash and dump water out of his pitcher. This was the first time Jack has been in the big tub since he's been walking and standing on his own. Well...he thinks he is such a pro he was standing in the middle of the tub, not holding on...while the jets were on. I had to catch him about 3 times from going face first into the water. I tell you we are going to be kept on our toes with this one. I'm sorry I couldn't help myself...they are just so cute!!! In the morning when it's time for Owen to get out of his night-night undies (Pull-Ups). I take him into the main bathroom upstairs and sit him on the potty. To keep Jack out of Owen's business I put him in the tub so he can play. Lately after Owen is done he's been wanting to get in the tub and play with Jack. Owen loves to stomp so he is showing Jack how to do it and I love that Jack is imitating Owen! He loves his big brother so much! This week we are showing off our Playroom/Bonus Room /Laundry Room. I've already showed off our playroom here. We don't have a bonus room...so I'm showing off my laundry room. It's not really room though it's a closet off our dining room. When we moved Michael didn't want to take our old washer and dryer with us because they were on the second floor. So I used it as an excuse to go out and get front loaders. I love them! 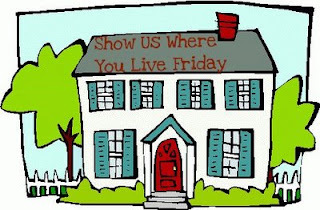 I know it's Show Us Where You Live Friday, but Kelly got a jump on it so I'm posting early too. 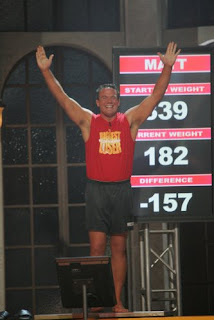 The winner of Season 2 of the BIGGEST LOSER!!! He was right in front of me in line for The Movie Cube. At first I caught a glimpse of him from the side and thought to myself...."Hmm that guy looks familiar". Then I remembered reading somewhere that he and his wife Suzy (She was also on the Biggest Loser) lived here in Washington. So I did what any self respecting person would do....I used the mirror in one of those grab toy bins so I could check out the front of his face without me noticing so I didn't make a fool of myself if it wasn't really him. I was in luck though....it was totally him! So I said, "Hey your Matt right?" He said, "Yeah!" I said, "My name's Lyndsay (shook his hand), you're such an inspiration". I asked him about his two boys. Did I mention I've read up the guy? That must be so totally weird for perfect strangers to know all about you. It comes with the territory though! After a few words he returned his movie and said goodbye. It was my turn to pick out a movie and I was shaking so bad I just remember thinking - Why didn't you bring your purse in, the camera was in there...and don't rent a movie you've already seen! On Saturday night the boys and I went to a BBQ at a family friends house. The boys got a couple presents because some friends of ours weren't able to make it to their birthday parties. Owen got this awesome bubble machine from Al & Ellen. I've been wanting to get him one of these for a while now. Waiting patiently for the bubbles to appear. I'm glad I read the instructions it took a few minutes for them to show up, but it was perfectly normal. A bubble popped out and this face...ah this face is of pure joy!!! They started coming out slowly at first. Then is was a bubble bonanza! I love the excitement in his face! He had popped so many bubbles his arms were so soapy and slimy feeling. It literally pumped out bubbles for a good 15 - 20 minutes and I finally turned it off and dumped the rest of the bubbles back into the container so we can use them next time. It was super fun, super messy, super slippery and super amazing to see the joy in my baby's face! Happy 1st Birthday Jackson Daniel! Who Thought Discount Tire Could Be So Fun!